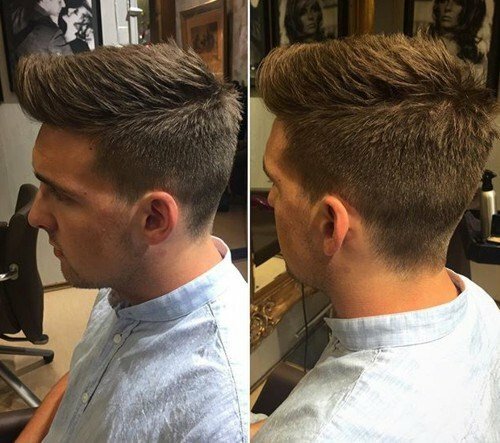 A creative and stylish haircut can give additional points to a man’s looks. 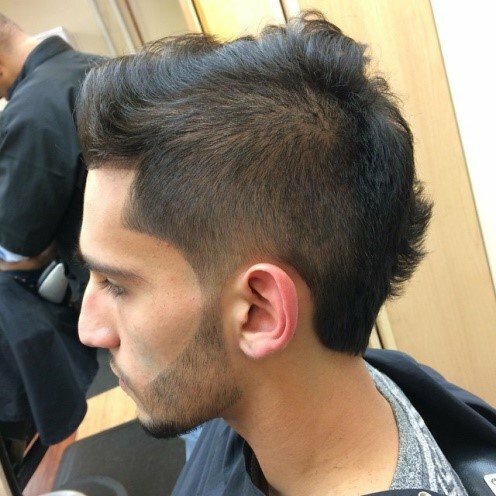 The faux hawk haircuts for men is one of the most popular haircut styles for men as it gives an edgy look but formal enough for business meetings. Also known as fohawk, this hairstyle has been adapted for years ever since the 1970s. Today, faux hawk styles also represent masculinity. The styles have been modified to create new looks that can increase a man’s confidence to the next level. The name Faux Hawks means fake hawk. The difference between faux hawk and Mohawk is the styling selections. 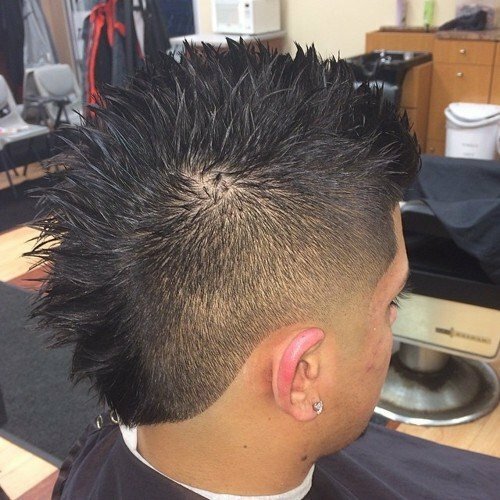 While both sides of the head are shaven and only a stripe of hair remains in the middle of the head in Mohawk, faux hawk hairstyles create waves and do not need to shave both sides of the head. 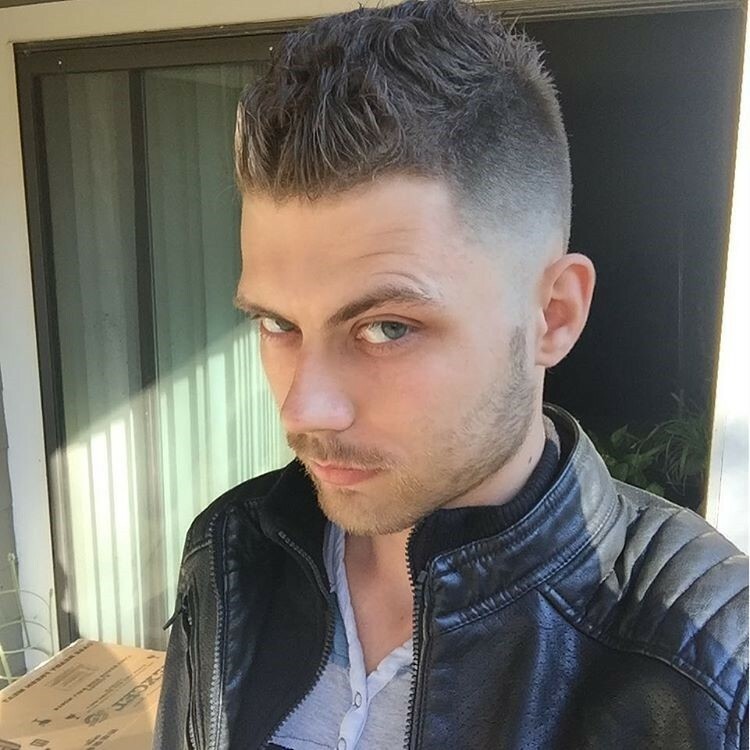 The hair on both sides are just cut shorter compared to the hair in the middle. The hair is longer in top so you can make spikes or create a point. There are many changes in faux hawk hairstyles as the time went by but the new versions are also loved by many. If you happen to see the old versions of faux hawk, you will realize all the changes occurred in this haircut. Faux Hawk hairstyles are common not only for boys but also for adults. Men just love any type of this style as it is not only edgy but it also looks like you can rock the dance floor. 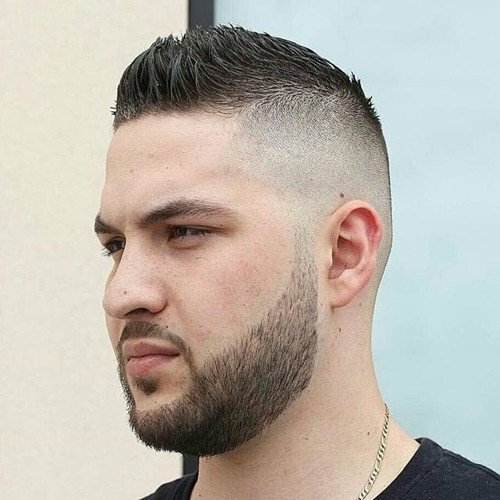 These haircuts are also professional enough for office setting so there is nothing to worry about if you think no one would take your haircut seriously. After all, faux hawk gives additional points to any outfit that you wear. Having a new haircut is like giving your appearance an update and faux hawk provides you a lot of options. You may not believe it but this style is definitely head-turner! 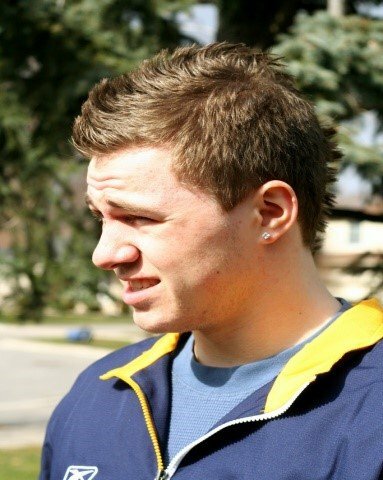 Here is a list of faux hawk haircuts that can upgrade your hairstyle. 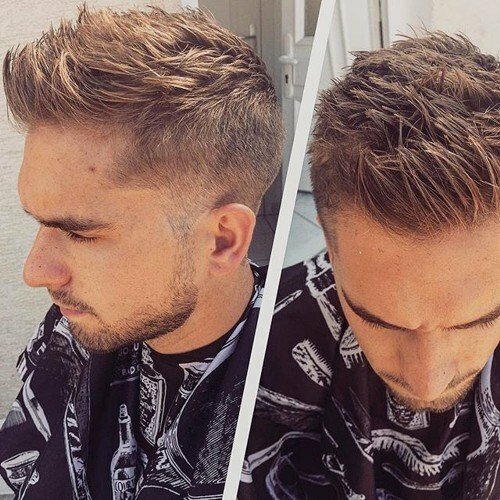 This style makes both side of your head faded as the hair on those areas is cut short. The middle section of the hair has a swirling effect. This style is great not only for office setting but also for going out. It also suits different colors of hair. 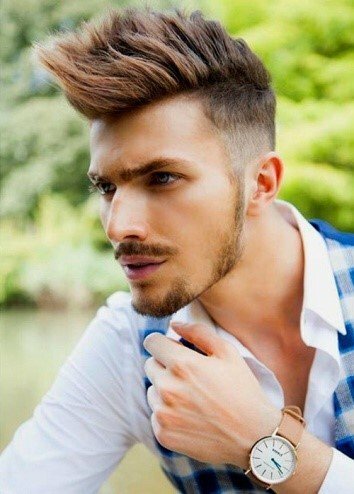 If your hair is straight, swirl effect faux hawk haircut would definitely look great on you. The hair on the crown is longer but also gives a humble impression. The sides have short hair like a clean cut and there is a visible line to highlight the groovy effect on top. People cannot resist to checkout this hairstyle as it look manly and stylish. You can also give your hair on top a different style whichever you like. 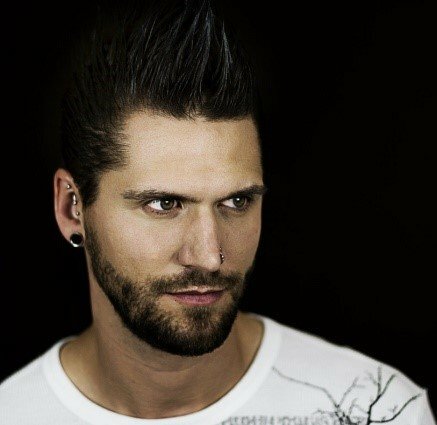 Another stylish faux hawk haircut for men is the layered version. You will be amazed after the barber finalized your hair. This style provides depth on the top and middle as it humbly fades at the sides. It also brings heavy but also decent impact. 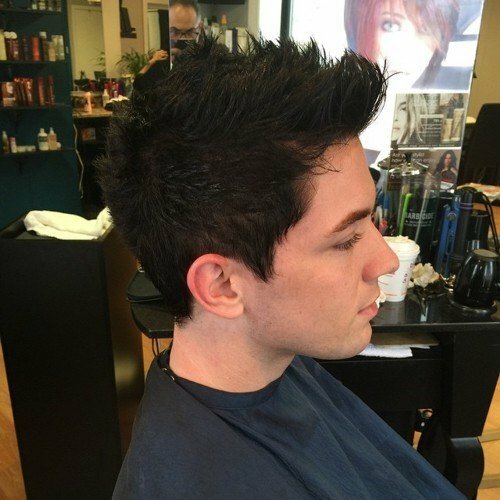 This haircut will look great on men with thick and straight hair. Curly faux hawk haircut is also one of the best versions especially if you have curly hair. The sides are cut short with faded effect while the middle and top are a little bit longer. Natural curly hair will form natural curls on top which makes the style look attractive and formal at the same time. You can also apply different textures on your hair. Like the name suggests, the sweep effect gives short sweep styles on top and at the back. The idea of sweep may not sound appealing but once you already apply the style to your hair, it looks just perfect. This creative style would be perfect for men who want to look wild but also proper. One of the best faux hawk haircuts for men is the spike version. 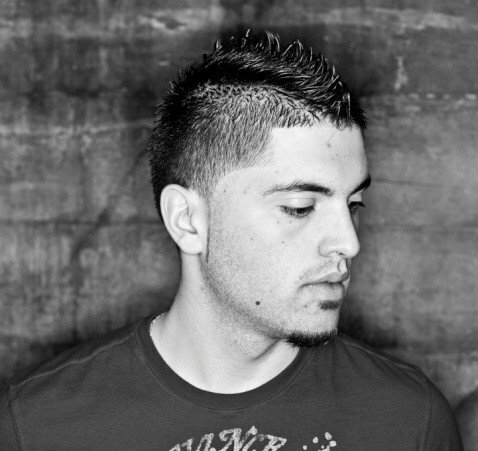 This style will provide you an incredible look as the sides are faded and the middle is spiky. It is best for going to parties as well as wedding events. This style is also great for going on tours or just outside as many people will appreciate the amazing look. 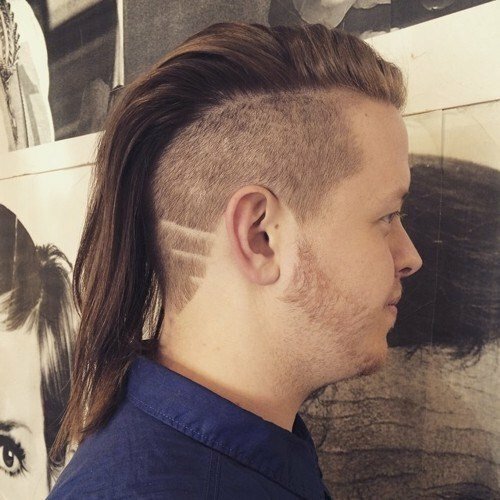 This haircut unleashes your masculinity by moving the hair away from your face. It is also like spiked effect but this style makes sure that there are no strands on your forehead. Simply comb the sides backwards to lessen the layer on top. Tilt the top a little to the back to leave a spike. For men with oval shaped faces, this version of faux hawk haircut would look great. 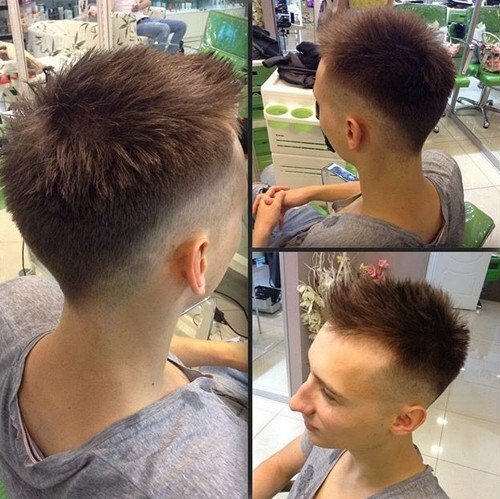 The sides are short while the center is brushed upwards and making long spiky effect. Different colors of hair will also look amazing with the extreme spikes version. It also looks formal enough for attending weddings. 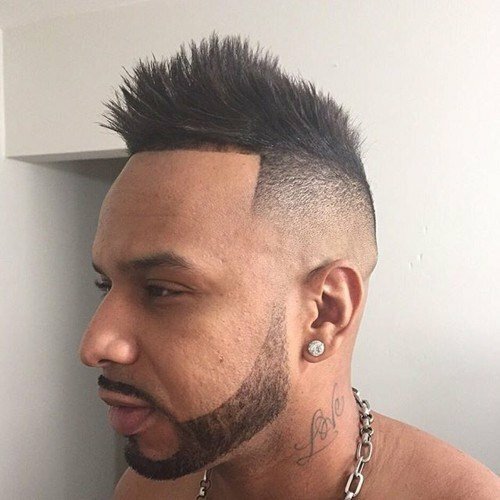 Most of the versions of faux hawk haircuts are faded on the sides. However, this version has full sides and there is no need to make them even shorter to gain more attention on the crown. The top has curl effects which are enough to make it groovy not only for outdoors but also for office setting. Another faded faux hawk haircut is the long faux hawk version. 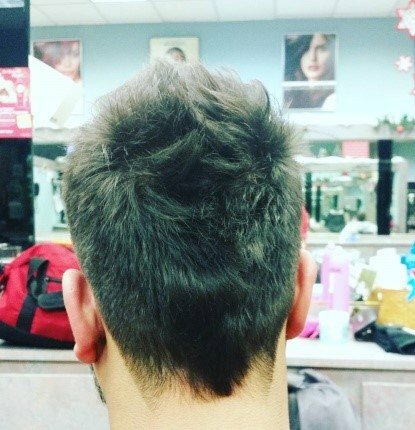 The sides are short and faded while the hair on top is long. The length can also depend on how long you want it to be. It gives both edgy and soft look. It also gives more emphasis to the top so you can make a spike effect. This style allows the hair to relax with oil to make a shiny appearance. The sides are also faded while giving more attention to the crown. The top appears to be like a crocodile’s spine which appears to be manly. No one could ever resists looking at this cute hairstyle. High top version gives more emphasis on the crown of the head. Both sides are shaved and it highlights the middle part. It looks great not only for natural curly hair but also for men with straight hair. 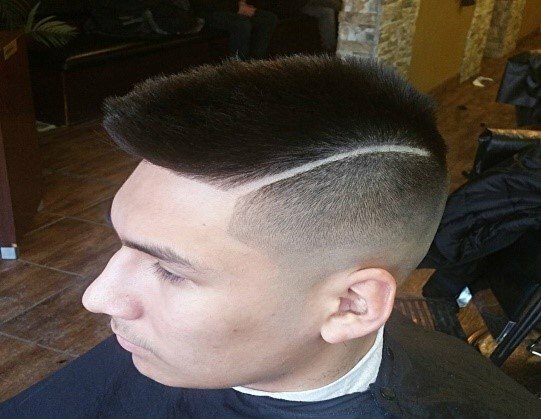 You can always tell the barber to cut the sides on your desired length if you do not want to totally shave it. This style adds more width and depth on your looks. 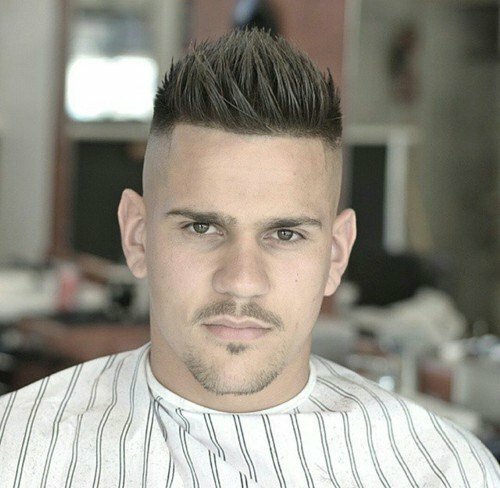 Instead of shaving the sides, they are combed to the front so it looks like they are embracing your head. The hair in the middle forms spiky effect just Mohawk but this one is completely different and even more stylish. This style is designed mainly for office setting and other formal events but you can always have this effect anywhere you go such as outdoors, movies or parties. It also gives you a professional feeling which can also boost your confidence. If you are into professional looking styles, you might love this version. 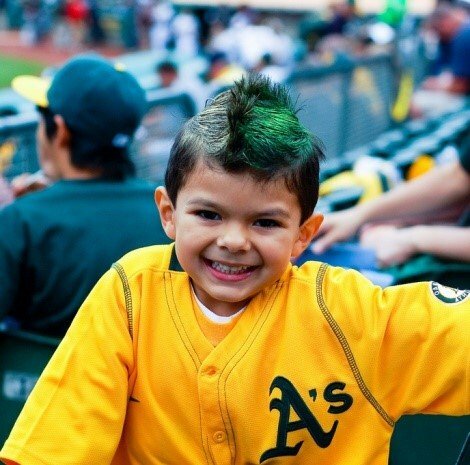 Faux Hawk haircuts are not only for the big guys but cute little boys can also enjoy it! They can also choose their own version of faux hawk. This style gives an adorable look as both sides are combed downward while the top is combed upwards to form a strip of spike. If you want to experience a tiny version of faux hawk, you might like this one. Both sides of the head are shaved which gives a fading effect. The crown area is cut short so you can only make tiny spikes. 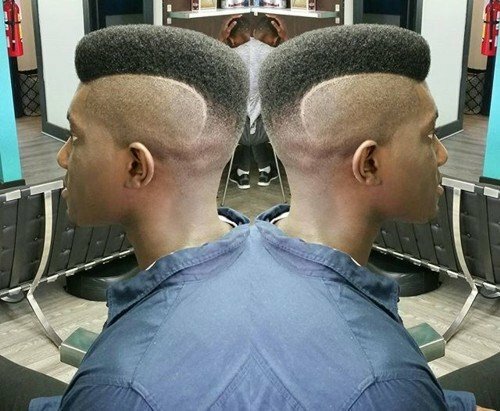 This haircut allows the people to pay attention more on your face than your hairstyle. It also gives you clean appearance. 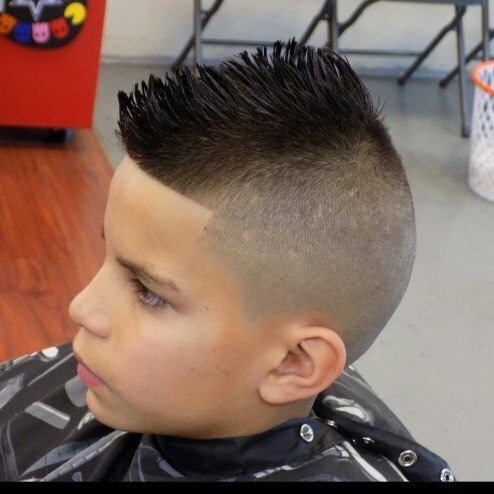 Another great style not only for men but also for small boys is the military look faux hawk. Both sides as well as the back are completely shaved while leaving enough hair on top that has a touch of military look. The hair on top are brought together to make a spiky effect but there is a visible line between them. 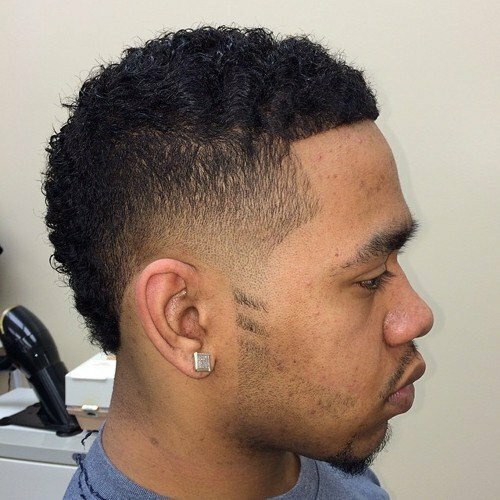 This faux hawk haircut is one of the best styles for men with natural curly hair. The sides are shaved completely with visible lines that separate the sides from the top. The hair on top is shaped like a volcano but formal enough as it looks clean. This style is great for going to parties and other events. Your bangs are always useful to make a faux hawk design. The messy top style has faded effect on both sides while the crown area has thick hair. The bangs are then formed into a messy style but the sides are clean enough to make it look both rock style and professional style. For another head-turner faux hawk haircut, ponytail style creates a unique look. The sides are cut very short while the middle hair is longer than usual. It produces a ponytail style that looks pretty amazing and catches all eyes. People with straight and silky hair can definitely enjoy this haircut. This faux hawk version gives more depth. The sides are cut short but not too short like other faux hawk styles. The waves are formed naturally. It also gives additional thickness to the hair. 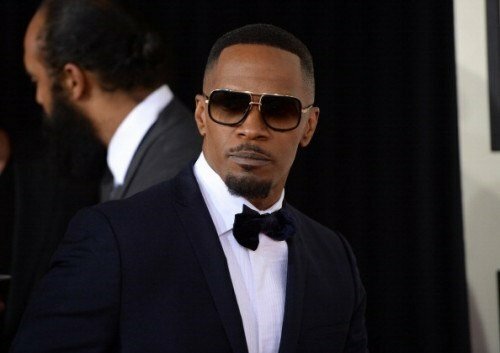 Most men have this hairstyle as you can easily modify the waves according to your preferences. This style will be great on people with straight hair. 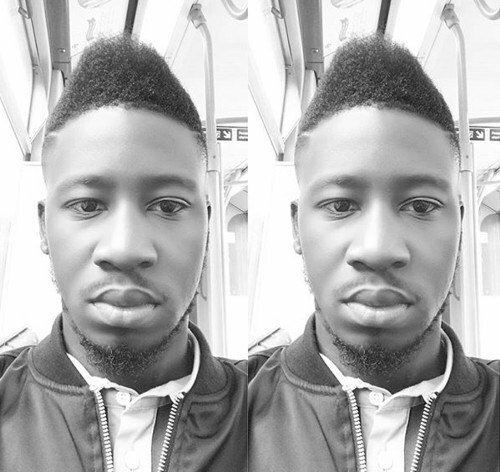 One of the most awesome faux hawk haircuts is the tapered style. This hairstyle does not only make you stylish but it also gives an elegant and smart look. This style is perfect for any setting whether going to business meetings or party. 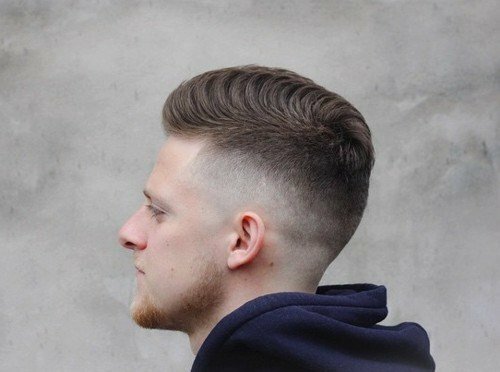 Tapered style is a clean cut with wave on top that can highlight you even if you are in a crowded area. Aside from ponytail, you can also select rat tail faux hawk haircut which gives an attractive yet formal appearance. This version started since the 1980s and still popular even today. 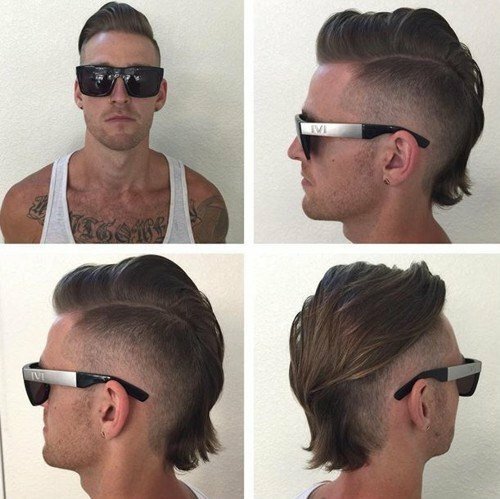 The design looks like a tail of a rat but the sides are shaved beautifully while the middle is combed backwards. Another faux hawk haircut that turns every head is the flipped version. If you have straight and silky hair, flipped hairstyle might look great on you. The style looks like a wave going to one side. Both sides are faded while middle creates a one big wave that can grab everyone’s attention. 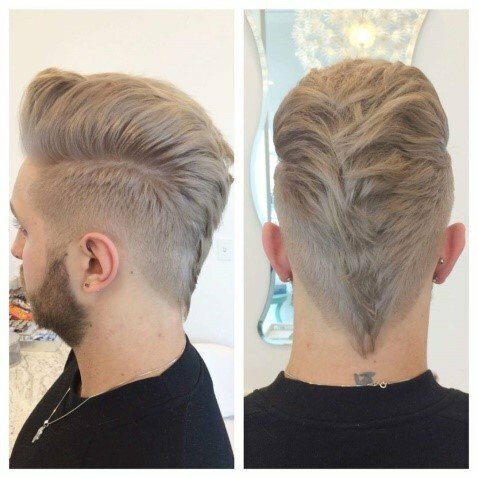 This haircut creates a very neat appearance on both sides of the head. Only the hair on the crown is long while both sides are shaved completely. The hair on the crown forms spikes which bring out the strong personality. This style gives a cap-like appearance. While the sides are shaved neatly, the hair above is brought together to create a pointed tip. It also has a round base which looks like a cap worn by ancient prophets. This style looks formal which is suitable not only for office setting but also for outdoors. If you want to have a rocker look but formal enough for going to work, you might consider this rock version of faux hawk. It has faded sides with spikes on the crown. If there is a hair code in your work then it always best to follow the rules. 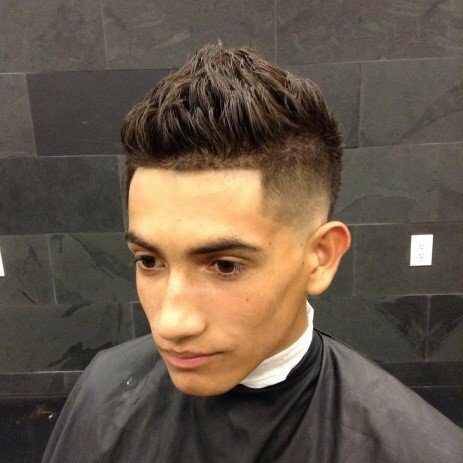 This professional faux hawk hair cut allows you to have fohawk hairstyle while having elegant or professional style. It is perfect for attending business meetings and leaves a good impression. Another faux hawk haircut that is known by most men is the square forehead haircut. This style is suitable in formal settings. It makes you look decent and clean with the square shape on the forehead. You can leave the top part shaggy as there is no need to make the top part perfect with a comb. 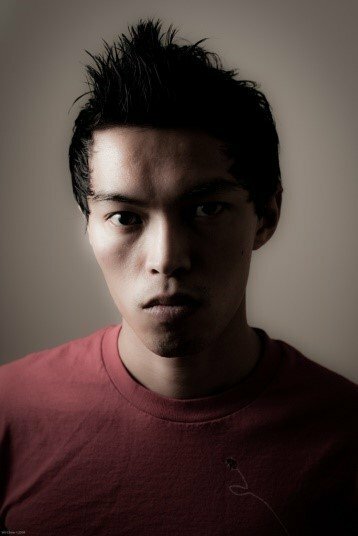 This style is also common to many actors as the sides are downwards while the top is spiky but a little messy. This style creates edgy and professional look.